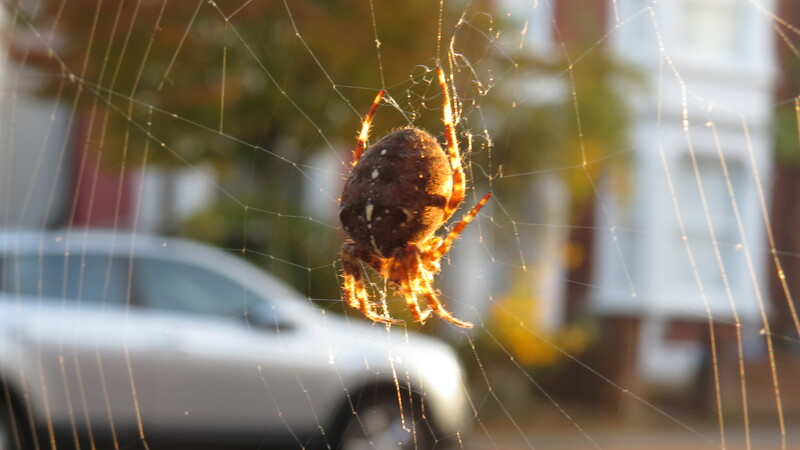 Dear Readers, on returning home from a week-long work trip, the first thing I noticed in the front garden was the way that the spiders’ webs were lit up by the late afternoon light. 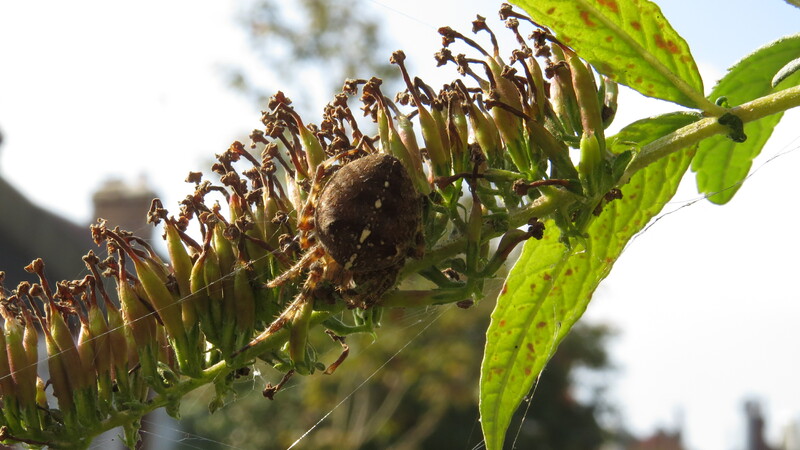 There are two garden spiders (Araneus diadematus) that are making their homes in the buddleia. This is a very widespread and common species – it can be found right through the northern hemisphere, so my readers from North America may also be familiar with these creatures. The first spider, the large female in the photograph above, is an early riser – by 9 a.m. she has already constructed her web for the day. For most of the time, she lurks on a flowerhead, with one ‘toe’ delicately placed on a strand from the web. The whole structure will vibrate if anything flies into it, and then the spider has to make a decision: ignore it, if the prey is too small, cut it from the web if it’s something dangerous like a wasp, or wrap it up like a burrito for eating later. A metre away, a much smaller spider has made her web. She rises a little later, and usually sits on her web, rather than in her shelter. Maybe because they came without any accompanying largesse, house spiders did not receive such a warm welcome in our house when I was growing up – indeed, on one occasion my grandmother dropped her hot water bottle onto a particularly large and hairy spider and flattened it. Whether the unsuspecting creature turned its eight eyes skywards and wondered what this rapidly descending rectangular object was I have no idea, but the method, though effective, was never repeated, largely due to the difficulty of extracting squashed arachnid from a candlewick hot-water bottle cover. 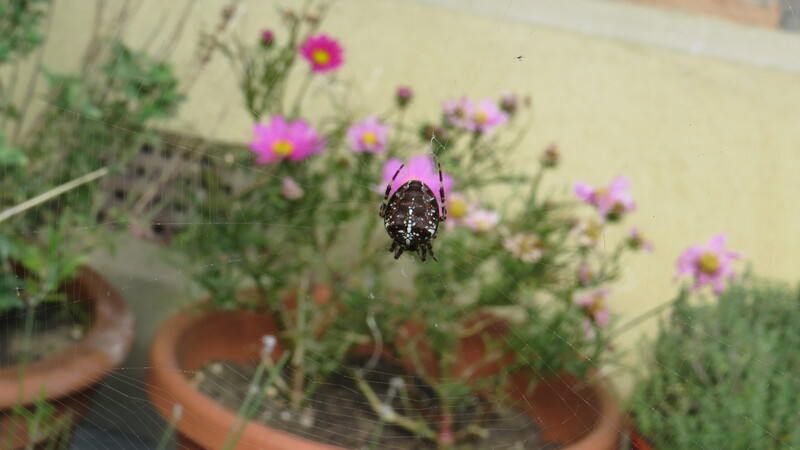 Still, in the garden spiders were welcome, and as a child I spent hours watching them making their webs . After seeing the diligence, skill and patience with which the spider goes about repairing her handiwork after some enormous clumsy child has fallen through it, I couldn’t help but be filled with admiration, and I am not the only one. Robert the Bruce was said to have gained determination by watching a spider try again and again to complete her web while he was hiding in a cave. Christianity is not the only religion to have noticed the spider, however. When I visited the Hagia Sophia in Istanbul, a building entirely devoid of human or animal representation, there is a spider’s web pattern in one corner. When The Prophet hid in a cave to escape the enemies who were trying to kill him, a spider spun her web across the entrance. When the enemies arrived at the cave, they surmised that no one was inside because the web was unbroken, and so The Prophet was saved. 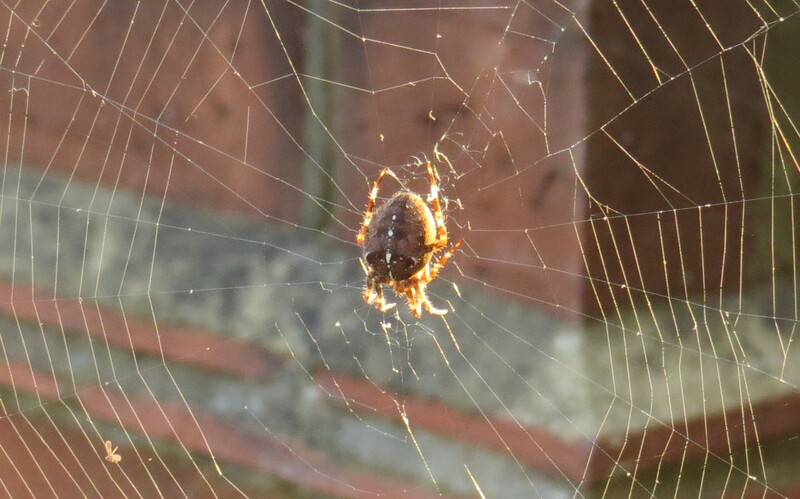 I had not watched a spider actually making her web for a long, long time, and so I spent a few minutes this morning watching one in my back garden doing her work. Note how the silk comes from two separate glands, and how the spider uses her right back leg to ‘spin’ the silk into a thread and her left back leg to attach it to the web structure. I wonder if spiders have a kind of ‘handedness’ in the same way that we do – certainly it’s been shown that some species of mammal have a ‘leading paw’ that they prefer to use for certain activities, but I have no idea if anyone has ever looked into this in invertebrates. It has long been thought that spiders can foretell the weather, and there is some truth in this. A spider sitting in the middle of her web means that the weather is likely to be settled for the next day or so. If the spider disappears to her shelter, this means that the weather is changing. Whether the creatures can sense air pressure, or humidity, or both is still a mystery. Incidentally, although they often look as if they’re vertical, spiders webs are usually at a slight angle, and the spider sits on the underneath side. 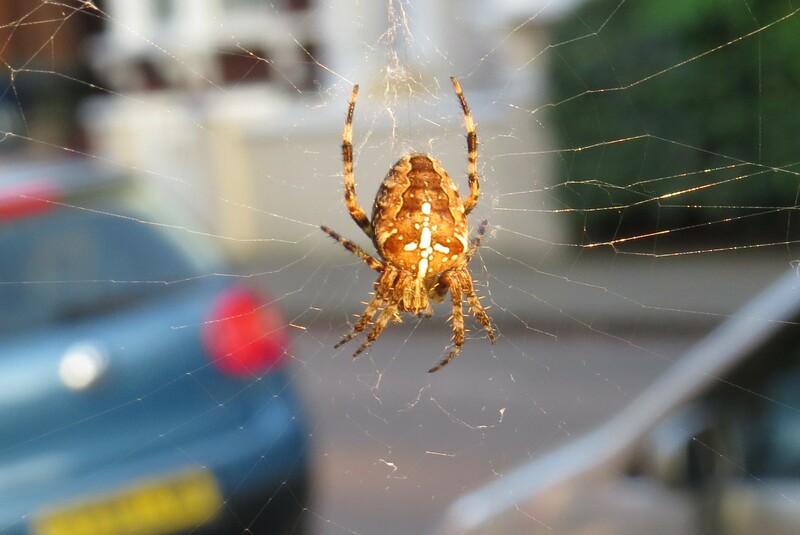 Garden spiders also normally sit ‘head down’ on their webs. One spider superstition that is extremely close to my heart is the belief that if a spider is found on a bride’s wedding dress, it will bring good luck for the partnership. When I got married in 2001, I gave my bouquet at the end of the evening to my mother so that she could enjoy the flowers while I was on honeymoon. When she took it to pieces she found, curled up in the middle, a spider. What better omen for the future could there be for someone who’s named themselves ‘Bugwoman’? 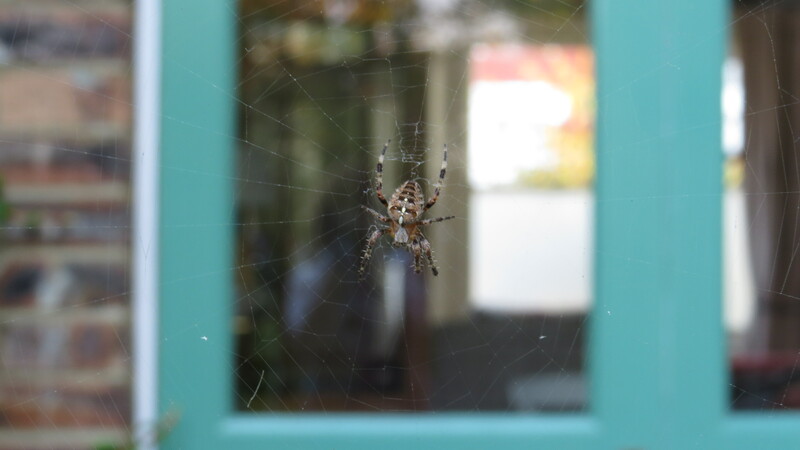 This entry was posted in London Invertebrates on October 10, 2015 by Bug Woman. Hello, what a phenomenal post! I enjoyed every sentence! Oh, thank you so much for sending the informative guide. I think what I saw may have in fact been an earwig. Since my apartment doors open to a small garden, any number of creatures can easily come in for a visit. I also googled some images of earwig bites, but everything I saw was far more extreme than the bites I had. After some more searching I happily discovered that earwigs are pretty benign, having no venom, nor do they seek out humans to bite, but will do so if provoked, which I would never do, anyway. NYC, like many cities, is in a bedbug battle, but after years of vigilance in my apartment on that front, and a recent, more careful search, I have never seen any evidence of bedbugs. So the study goes on….I look forward to all your posts! Katya, also google ‘devil’s coach horse’ – not sure if you have them in the US but another formidable-looking but totally harmless beastie. Your bites don’t sound like bedbugs at all so no worries on that front! Thanks Alison! It’s what I love about blogging – it reminds me of how plants and animals have been a constant thread through my life.